There are some classic computers that just LOOK like a computer should. 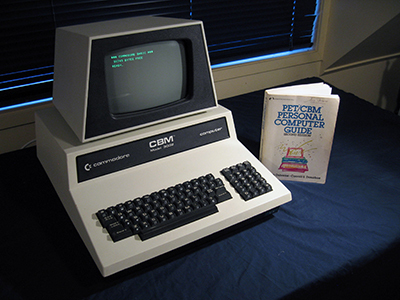 Yes, if retro-style has a winner, it would have to be the 3032 variant of the Commodore PET. Presented in a beautifully-designed, symmetric all-in-one case, this 32k full-stroke keyboard successor to the chiclet-keyboard Pet 2001 makes a visual splash. 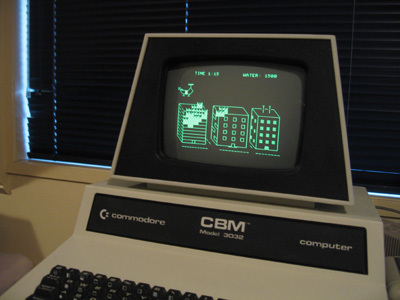 At the time of release in 1979, the other contenders on the market were the TRS-80 Model 1, the Apple II+ and the Atari 800. Although less visible in the marketplace than those listed above, the machine was solid competition, and sold well especially in Europe. Their rugged integrated design made them popular in schools. When I saw this unit on sale, I just had to have it. It wasn't even working but the lineage, sleek lines and excellent external condition spoke to me of a classic model. It's badged as a CBM machine, which is the usual labelling for most PETs marketed outside North America. It took some fixing (which included a CPU board replacement) before I could see that boot-up screen in the photo above. However, with a little help from my friends it's now back to a working state. Like all early microcomputers, the PET has its share of idiosyncrasies most of which were carried over to the Vic-20 and C-64. One of these is PETSCII characters. These are graphic characters pre-defined by the character generator and assigned to a key. Through clever programming, using these characters meant pictures and shapes could be assembled on the screen with lines of quite fine resolution. This is the ONLY way a PET can display pictures, as it has no native graphics mode. However, these PETSCII characters did the job and made the pictures displayed on some other computers of the day clunky by comparison! Another strange feature is the lack of numerals along the top row of keys? The only things there are the characters you would normally find when those keys are used with <SHIFT> on a normal keyboard. To enter a number, one has to use the keypad! Use those keys with <SHIFT> and you get a PETSCII character. I do love the full-screen editing though. The PET has no real disk drive (yet). Loading programs from tape used to be the only way of showing it off but a modern-day PETDisk allows my software library to be loaded instantly. It also has a manual for company. A wonderful vintage item I am very pleased to own!